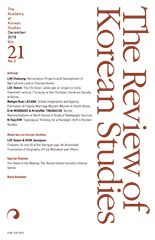 Yim Min-Hyeok,(2005).The Establishment of Literati Governance Society in Early Joseon, and Its Continuation.THE REVIEW OF KOREAN STUDIES,8(2),223-254. From its conception, the Confucian intellectuals of Joseon began to use literati governance (munchi in Korean) as the dynasty’s ruling mechanism in order to actualize their dreams of bringing about an ideal society based on Confucian ethical principles. Thus, it was only natural for these individuals to perceive military officials as a class of people who should not only be denigrated, but discriminated against as well. The philosophical background of these Confucian intellectuals can be said to have its origins in Mencius’ concept of a virtuous government (王道, The Way of a good king), in which he advocated the supremacy of a literati governance system based on the notions of virtue (仁, ren) and righteousness (義, yi) over a military-based one. The main notions of this literati governance are clearly evident in the proclamation of the foundation of a new dynasty by Yi Seong-gye (King Taejo, r. 1392-1398). As part of their quest to create a new concept of the state, those who succeeded Yi Seong-gye to the throne also adhered to the principles of his literati governance. Confucian scholars, who perceived the limitations of a military-based governing structure, attempted to design a state that was based on a literati governance system. Even as Joseon found itself rocked by the instability resulting from constant encroachments of Japanese marauders and Jurchen tribes, these scholars continued to be critical of basic defense policies such as conducting military exercises (gangmu in Korean), fortifications, and increasing military expenditures. For these scholars, the most important quality that a ruler should display was that of virtue towards the general population. As a result, those military officials within the various government departments soon found themselves being discriminated against. Their success in building such a literati governance system is clearly evidenced by the inclusion of a clause in the Great Code of Joseon that only literati officials should be entrusted with the task of operating the core political organizations. In terms of foreign policy, these intellectuals adopted a policy of “serving the great” towards China (sadae in Korean), while establishing amicable relations with Japan and the Jurchen (gyorin in Korean). In addition, the intellectuals needed to establish the ideological symbols required to create the unified structure which would have to be put in place in order to actualize this literati governance system. This process was exemplified by the establishment of National Confucian Shrine (munmyo in Korean) and the subsequent downgrading of the Military Shrine (mumyo in Korean). Moreover, the consolidation of the literati governance system and weakening of the perception of military defense resulted in the practice of conducting regular military exercises also being increasingly discarded from the reign of King Seongjong (r. 1469-1494) onwards. In fact, during the reigns of the Yeonsan-gun (r. 1494-1506) and King Jungjong (r. 1506-1544) this practice was all but abolished altogether. The literati governance ideology developed by these Confucian intellectuals is also clearly visible in the concept of the state and national defense strategy which prevailed during the reign of King Seonjo (r. 1567-1608) when the nation found itself under foreign attack. While King Seonjo displayed a strong willingness to repel the invading forces, leading Confucian intellectuals of the day such as Yi Yi, Jo Mok, Kim Wu-ong, and Yu Seong-ryong emphasized the need to guarantee peace and order among the people based on the Confucian concepts of virtue and righteousness. In other words, even as battle raged all around them, these scholars continued to adhere to the Confucian concepts of virtue and righteousness found in the literati governance system as the basis of their defense policy. This kind of notion provides us with some insight into Joseon’s perception of defense and its strategy during the Hideyoshi Invasion of Joseon. Moreover, this kind of notion also provides us with a clue as to why the Joseon dynasty was able to survive for as long as it did.